Yesterday night I went to the preview performance of Clay and Paper Theatre’s summer show, The Circus of Dark and Light. I was there to take pictures and shoot some footage for the first video in the series I’ll be working on while I’m here at the Toronto Arts Council. The show was great. The sets, costumes and of course the masks and puppets are beautiful and everyone around me loved the show. I am not a stranger to Clay and Paper Theatre, in 2008 (during the rehearsals and run of their show Horse Feathers,) I was one of their summer interns, running the administrative side of the company while their general manager was participating in a program at Vermont’s Bread and Puppet Theatre. Clay and Paper was my introduction, as an adult, to the world of Neighbourhood Arts. 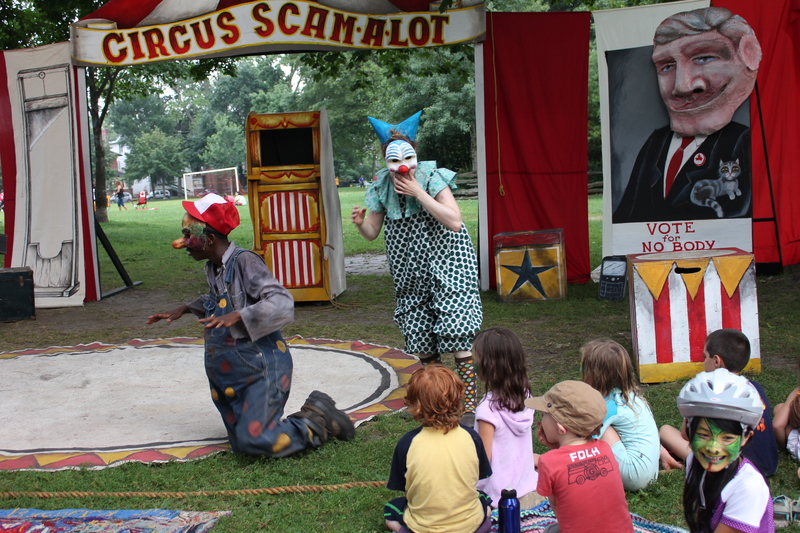 My focus as an artist is in narrative, indoor theatre, and before my work in Dufferin Grove Park, I was never really that interested in theatre that happened outdoors. In my early adolescence, I had developed my answer to the eternal question being asked to me by family friends and teachers: “Why Theatre? Why not film?” My answer always focused on setting. I would tell them that I loved the idea of the space of the theatre. That when one was in an audience, they were locked in a dark room with a story and a knowledge that all normal rules of existence had the potential to be suspended within that space. I spoke about control, about being fascinated by the idea of everyone sitting in a room and being so well behaved for so long, by the fact that we would sit and watch people who we knew were not really who they said they were, go through things that we knew that they were not really going through, in a silly little representative world that we pretended was as big as the real world. 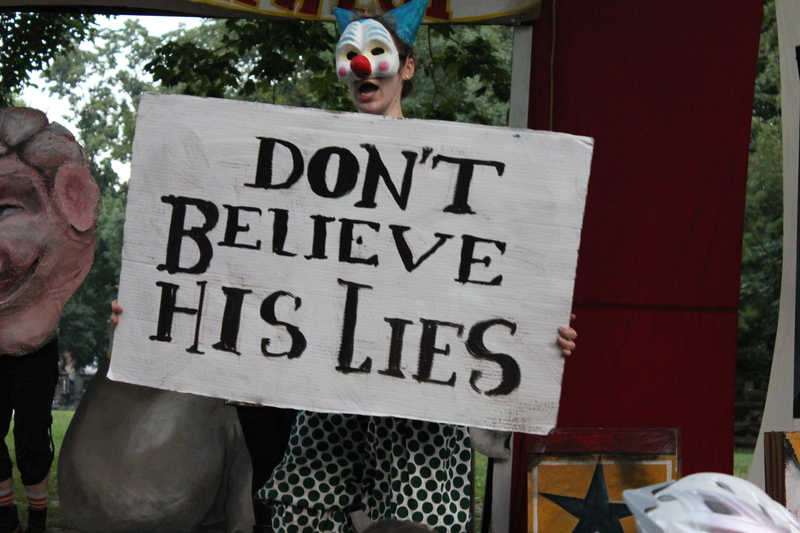 When I started working at a theatre company that performed in the middle of a park, I had to rethink my position. The theatre that we were doing at Clay and Paper was undoubtably still theatre, but did not have the characteristics that I claimed to love about theatre. 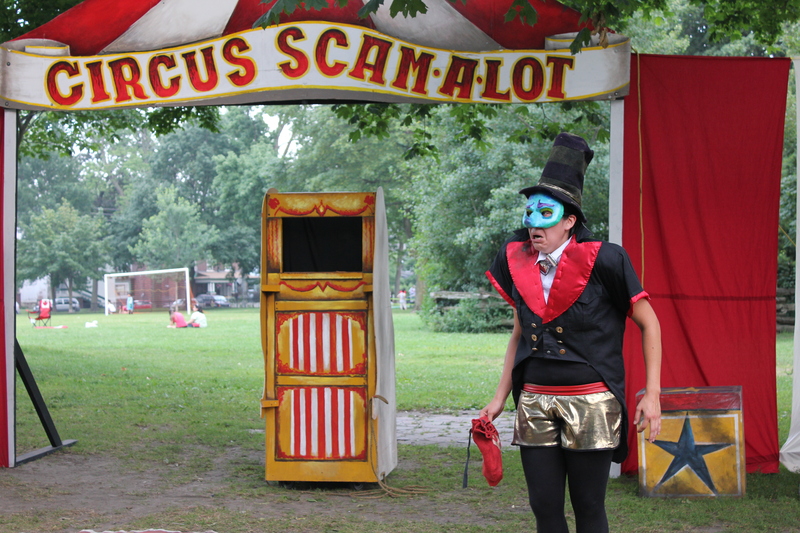 I began to appreciate the show in Dufferin Grove Park, and the way the setting effected the artistic work that was being done. 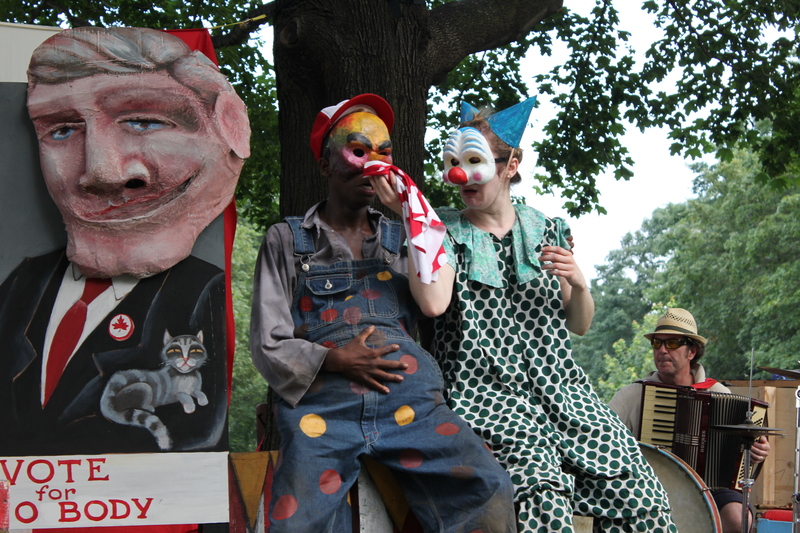 There is a spontaneity about outdoor theatre, especially when it’s in public spaces. Anything can happen. There is something to be said for theatre being accessible, being PWYC, in a public area and not locked up for only people able to pay the $45 ticket price. What I loved was how the theatre didn’t have borders and neither did the magic that was created. To put theatre in a public space is to make the entire world your black box, to suspend the rules of ones community and turn it into a place where anything can happen. Though my focus of my theatrical activities continues to exist within the confines of a building and even *gasp* a proscenium, I now am really excited by the companies in Toronto that do their work outside and I urge all of you to go check them out. You can see some more of the photographs I took at Clay and Paper’s Preview performance of The Circus of Light and Dark on the Neighbourhood Arts Network’s Facebook Page. Video focusing on the show coming soon. 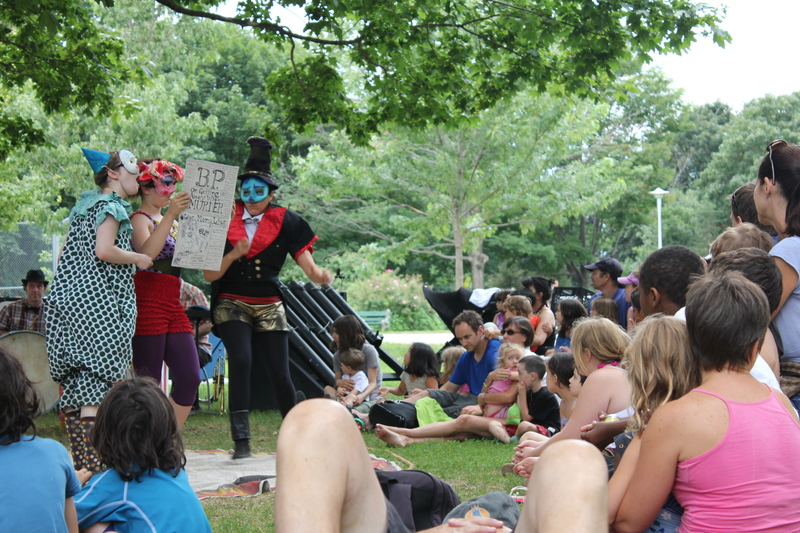 This entry was posted in Events, News, Uncategorized and tagged Clay & Paper Theatre Dufferin Grove Park by Neighbourhood Arts Network. Bookmark the permalink.